The mushroom that glows in the dark! After working with several species of bioluminescent fungi, we have selected Panellus stipticus for ease of cultivation and reliable glowing effects. The mycelium gives off relatively low levels of greenish light and is only visible in complete darkness after about 5 minutes of allowing your eyes to adjust. The cultures do not glow early in their growth and may take several weeks to begin producing visible amounts of light. The glow is dependant on available oxygen and dramatic and sudden increases in brightness can be achieved when cultures are exposed to the open air. The primordia, pins and mushrooms themselves glow very brightly and can be easily observed in less than complete darkness. 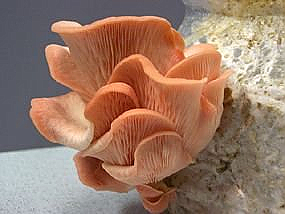 The mycelium can be grown on a wide variety of wood, grains and agar formulas under a wide range of temperatures. Mushrooms grown on whole grains or grain flours typically do not develop normally and abort at a small size. 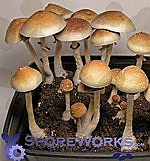 Plug culture on logs or woodchip/sawdust blocks are recommended for observing normal fruiting. The images below show Panellus fruits produced using the Wood Based MycoBag(TM). Decently formed fruits are easy to obtain when the substrate material is removed from the bag and placed in a humidity chamber or tent with increased air flow. Odds of fully developed fruits increases if you are able to keep colonized substrate block in outdoor environment without drying or exposure to excessively cool/hot temps. Images at bottom illustrate the bio-luminescent glow of this Panellus. The top image shows glowing mycelium formed in a rye berry based spawn bag (included in our spawn starter kits). Bottom image shows glowing Panellus mycelium on agar plate. Images taken on 100ASA film with Nikon F90X, 28mm lens at 3.5 aperture. Exposure time was approximately 20 minutes in complete darkness. Image at very bottom had a prolonged exposure time of 2.5 hours. Images generously provided by b+elladonna. Thanks!